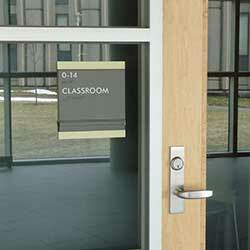 Need ADA or wayfinding signage for your project? 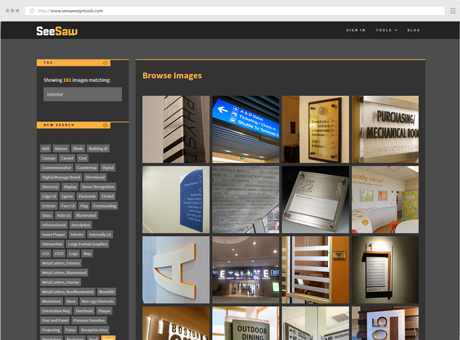 Savvy building and design professionals find better sign solutions at SeeSaw. Each family is created and curated by professional environmental graphic designers. Style is not just about looks — our families have been designed to suit a variety of project types. ADA & building codes are just the beginning — you have operational and wayfinding needs, and our families have you covered. Several, actually. We've re‑imagined traditional approaches to signage. Our quick and easy automatic specification generator gives you project-tailored 101400 specs and companion design drawings for one of our sign families. Don't need to bid? Get the benefits of a turnkey sign program with our design-driven and tailor-fit process — but with lower costs and less time than "the old way". 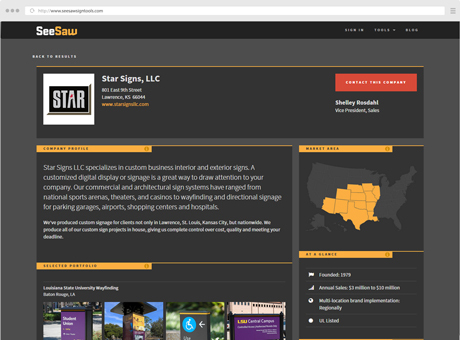 We've invited the best architectural signage companies in the nation to join the SeeSaw network — explore their capabilities and put them to work on your project. We believe all buildings deserve Good Signage. Good Signage is comprehensive, accurate, complimentary, unified, brand-reinforcing and designed to respond to the needs of the project. Good Signage is successfully implemented by following processes that ensure quality fabrication, efficient delivery, and problem-free installation. SeeSaw is committed to bringing Good Signage to all types of projects. We do this by providing comprehensive and open-source sign families as a basis for design, tools and processes for effectively implementing signage programs, and our national network of vetted independent sign companies. With SeeSaw, you're not just buying a product; you're buying a process — one that leads to a comprehensive, cost-effective, and quality sign program. SeeSaw helps you get well designed, high quality, code-compliant signage on your walls with minimal effort. Use the specification generator to create construction documentation, browse through hundreds of images of signs, or search our network of top-shelf architectural sign companies. 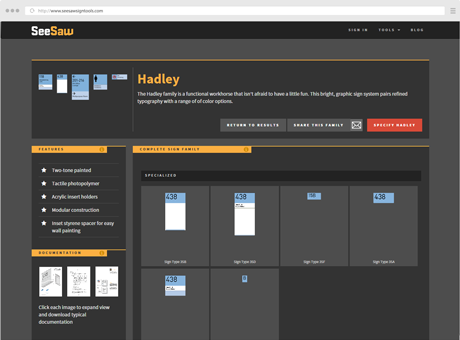 What do I get when I use the SeeSaw specification generator? You will be able to download a custom generated CSI section 101400 specification in Microsoft Word format; a PDF of design drawings (8.5" x 11"); and a guide to understanding and using the specification. How long does it take to get a specification? We mean it when we say minutes! Once you’ve selected a sign family you’re nearly done — just answer a few questions and set up a free account. Your documents will be ready for download immediately. Posted December 3, 2015 by Travis Veigas & filed under Blog. 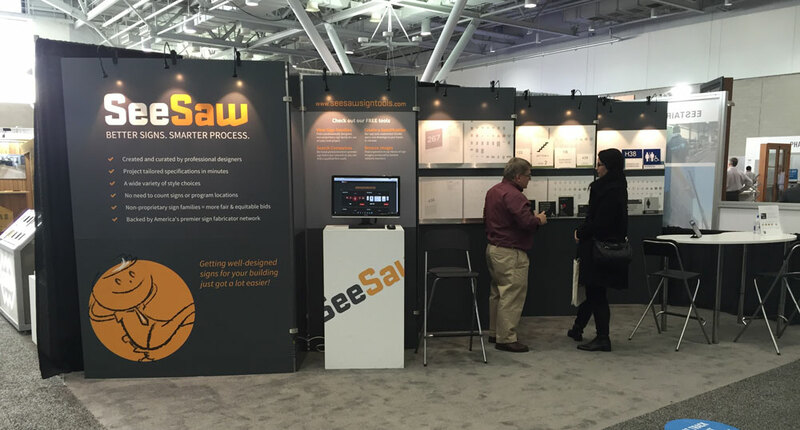 SeeSaw recently exhibited at the ABX 2015 conference and expo in Boston. Posted February 9, 2016 by Anton Veigas & filed under Blog. 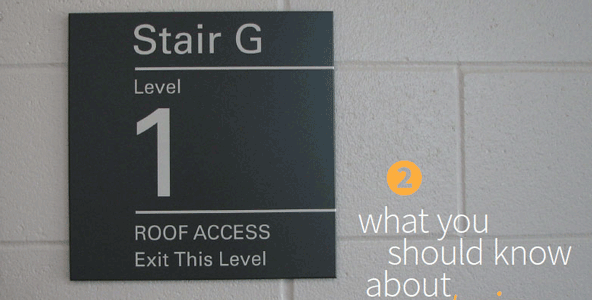 As one would expect, there are a lot of regulations surrounding egress and stairwell signs. 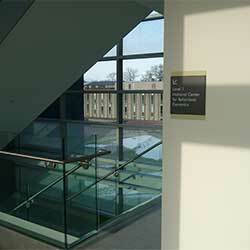 Signs are required for interior exit stairways that connect more than three stories. 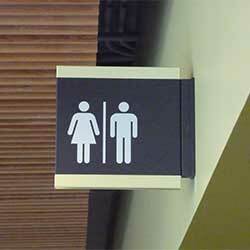 And the 2012 International Building Code has introduced new regualtions governing stair signage. Posted April 8, 2014 by Travis Veigas & filed under Blog. Executing a sign program for your facility is just like any other design-construction project: you need common sense and a good plan. Asking potential sign design consultants the following 5 questions will enable you to make the very BEST possible selection.